With James Harden inbounding the ball, the rest of the Thunder players set up in a diamond formation at the top of the key. Serge Ibaka and Durant stand at the elbows, Daequan Cook positions himself in the middle of the lane, and Westbrook waits just outside the 3-point line. The play begins with Westbrook coming off a Durant screen on the weak side of the Thunder’s diamond formation. 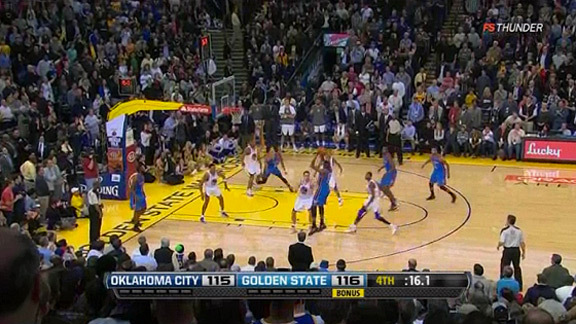 Westbrook is wide open when he comes off the screen. Durant does a great job of hitting Westbrook’s man and slowing him down. Not to mention that since he’s Kevin Durant, the NBA’s reigning scoring champion, much of the defense’s attention goes to him. Monta Ellis, who is guarding Cook, should be sliding down to help on Westbrook, but he is caught flat-footed because he’s watching Durant. Despite the space made for Westbrook, Brandon Rush gets into the passing lane and Harden chooses not to make the pass. 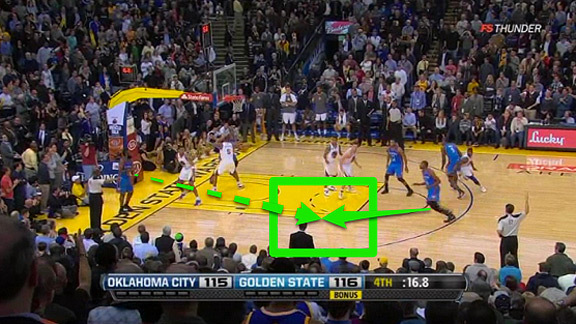 Instead, he looks for the second option — Durant coming off a screen from Ibaka. 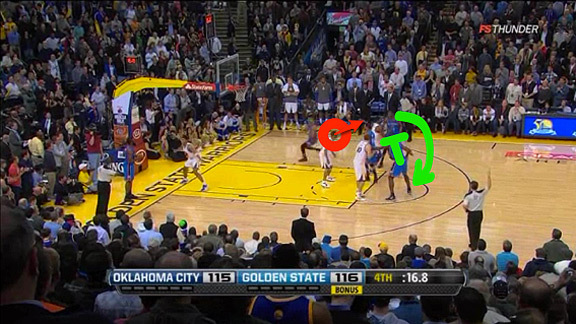 As Durant uses the screen, the Warriors’ defense makes some mistakes. Ellis is caught staring again. This time, he’s watching his own man, Cook. David Lee, who’s guarding Ibaka, is also focused on Cook, who hasn’t moved from his original position but is always a threat to pop out for a jump shot. Lee also needs to be prepared for Ibaka slipping a screen and diving right to the rim if Lee jumps out to stop a Cook catch-and-shoot or tries to help on Durant coming off the screen. The risk of giving Ibaka a game-winning dunk prevents Lee from helping. Also, when Rush jumped into the passing lane to keep Westbrook from getting the ball, it opened up the other side of the court for Durant. The defensive error that Lee (and Ellis, to a lesser extent) makes, allows Durant to cut unimpeded to the strongside elbow. Durant’s biggest weakness is moving through contact without the ball, but with the effective screen and defensive miscues, no one bumps Durant and he receives an easy chest pass from Harden. Durant makes the catch and has enough time to take a rhythm dribble and rise for a jumper before any defender can challenge the shot. He banks it in to win the game. 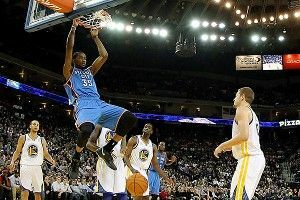 Durant’s lack of strength has hindered him late in games. Too often, stronger defenders knock him off his path, and screens and cuts become ineffective. 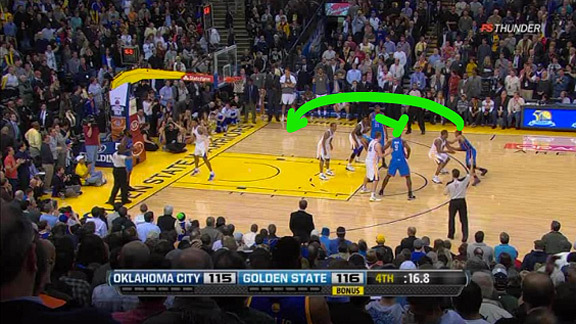 For this reason, the Thunder tend to isolate Durant to make sure that he gets the ball. But the play Oklahoma City ran against the Warriors caught the defense off-guard and allowed both Durant and Westbrook to be late-game threats. The defenses had to pay attention to Westbrook coming off that first screen, and when they did, Durant was free on the other side of the court. If the Warriors were dead set on stopping Durant, Westbrook probably would have gotten an easy attempt. If the Thunder keep running plays like this, instead of static isolations, their late-game woes may cease to exist.